I am glad to inform you that I have been offered the position of ‘Decision Scientist’ in Mu Sigma. I would like to thank the Great Learning Mentors for their guidance and support. To tell you more about the Mu Sigma process, Mr Ankur’s session for the aptitude, reasoning and video synthesis provided the platform for what to expect in the initial stages of the interview. Special thanks to Mr Tomy for his interactive sessions on how to crack the Mu Sigma interview. Starting from the nuances of the step-by-step approach to be followed in the group activity to the possible challenges we could face in the personal interview, his sessions proved to be extremely helpful. I could relate to and follow his advice on the do’s and don’ts during the interview process, which helped me land this job. He was readily available to answer my queries and concerns throughout. He extended his support and followed-up until I got the offer letter which I regard highly. Coming to the PGP-DSE course, Mrs Uma and Mr Vinodh were ready to take feedback from us, hear out our concerns and doubts, and come up with suitable action plans like arranging additional classes. This was extremely helpful in getting clarity on the topics covered. I would like to thank all the professors of the PGP-DSE course who imparted their knowledge to us on various subjects. Special Thanks to Mr Mahesh Anand for his great sessions. I would also like to thank Ms Richa Agarwal who was my mentor during the Excelerate session. Her tips to improve my CV and also on preparing for the analytics interviews were extremely helpful. 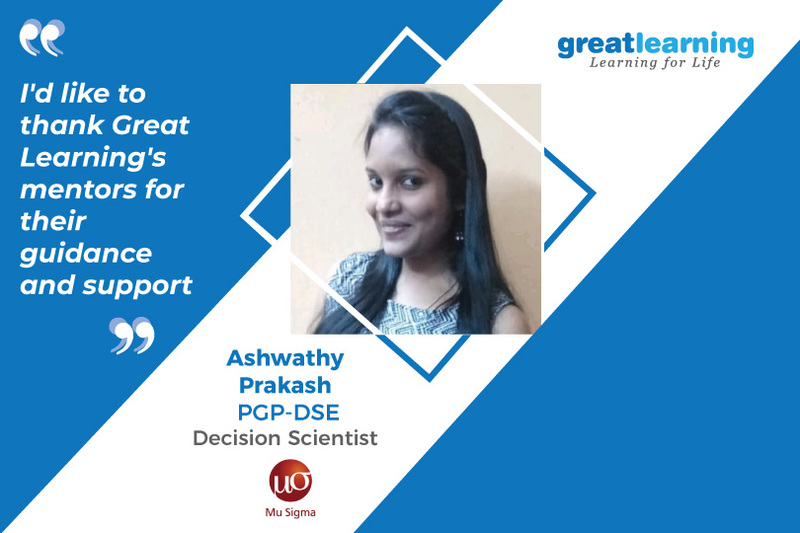 Great Learning’s Excelerate is a great idea which connected us with the experienced industry professionals and we got to know their views on the data science field. I thank our Project Group Mentor, Mr PV Subramaniam who extended his guidance. We had the opportunity to do more hands-on learning during the project phase and learn from his expertise. The importance of the Capstone Project was visible in the Interview, where in-depth knowledge was tested. Again, thanks to the management and team for the efforts they had taken, I highly value it!